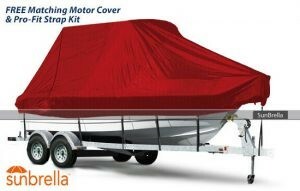 I have available 2 Windstorm boat covers made in Sunbrella material. One is Pacific Blue and the other is Black. Zipper access door, Velcro slit so antennas can stick out thru cover. Tie down straps and motor cover which acts as storage bag. These are new covers that have never been sold. Special Price: $875.00, free shipping. No warranty on these covers.